I'm a huge fan of Snyder's Study trilogy, so when I heard about this book I was beyond excited. 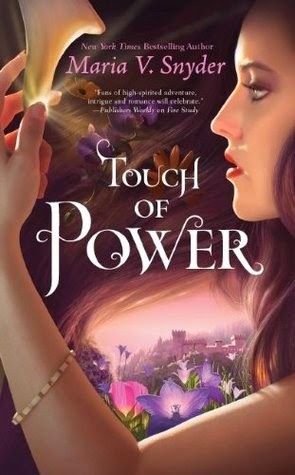 Having read I can say that Touch of Power is full of magic, adventure and a spell binding romance! Snyder has once again done a fantastic job of creating a set likable and layered characters. Avry is kind, smart, and strong willed - everything I admire in a female lead. I loved her interactions with Kerrick and his men, the banter between them was hilarious. At first, I wasn't a fan of Kerrick. However, as the book progresses you begin to see the softer side of him, and I (along with Avry) began swooning *cough* I mean warming to him. The world building was brilliant, the rich description and vivid imagery sets you on edge as you begin to learn about the different realms. The villain was an interesting character. For the most part I saw him as evil, but there were instances where he would suddenly change and become almost charming and vulnerable. Overall, Touch of Power was an enjoyable read and I look forward to picking up the sequel. Loved this book! While it doesn't live up to my EPIC love of the Poison Study series (my favourite of Snyder's book series) but it follows it close behind. Glad to hear you enjoyed it. I had almost exactly the same thoughts on this book! :) Loved the lilies as well. that was something I wanted to know more of. Hopefully next book will come out soon enough. So jealous you've read it already. Glad you enjoyed it!! It's always the best to start a new series by a favourite author and fall in love with the new book as well.